Wouldn’t it be better if you didn’t have to worry about where to put your trash after your home renovation project is over? Or, wouldn’t it be so much nicer if you can just put all the garbage outside your property at night, and find them gone when you wake up the next morning? 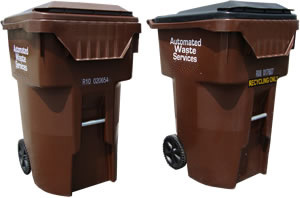 With Automated Waste Services, you have a number of trash removal options to choose from. Go for the service that best fits your needs and your budget on any given day, and we will do the rest for you. Our basic services come in two flavours: hook roll-off rentals and residential waste removal. The first option allows you to simply stow all your trash inside our various-sized containers for easy transport to the nearest landfill. Alternatively, you can simply sit back and let us do the whole job for you. All you need to do is to leave the trash outside and we’ll pick them up and dispose of them properly. Why waste your time on waste when you can better spend it on more constructive things like putting the finishing touches on your kitchen or shopping for a new couch? Or better yet, why not spend the time playing with your children or holding a backyard barbecue? We will let you free up your day’s schedule to do the things that matter to you the most. Curbside Trash Removal is done once a week. A 96-gallon kart will be provided. This is big enough to contain all the things you might want to throw away within the span of seven days, yet still small enough not to attract attention to itself as it sits on your front yard. Curbside commingled recycling services: we will take charge of recycling your unwanted materials and help you do your bit for Mother Earth. We know how precious your time is, that’s why we make it a point to arrive at your doorstep right on time to haul away your junk as quickly and efficiently as possible. You don’t even have to call us—we’ll drive over to your address at around the same time every time to pick up your trash, just like clockwork. That means that you won’t have to rearrange your weekly schedule just to make room for your trash pickup appointment. However, we do observe certain holidays. You may check our holiday schedule on our contact page. Our staff are friendly, polite, and ever ready to help you with your garbage disposal problems. Ask us how we can help you deal with your trash today. Our waste management services provide exactly that – waste management. Set up services with us and all you have to do is make sure that your trash kart is at the curb on trash day. We’ll manage the rest!